Lighting products that have earned the ENERGY STAR certification deliver exceptional features, while using less energy. Saving energy helps you save money on utility bills and protect the environment by reducing greenhouse gas emissions in the fight against climate change. Light fixtures that have earned the ENERGY STAR certification translate to quality, cutting edge design and the latest in efficient technology. Use 90% less energy and produce about 70-90% less heat than traditional models using incandescent light bulbs. Distribute light more efficiently and effectively — with custom design around the efficient light source to get the best performance. Deliver convenient features such as dimming on some indoor models and automatic daylight shut-off and motion sensors on outdoor models. Last 15 times longer and come with a manufacturer-back warranty of at least three years. Light fixtures originally qualified for the ENERGY STAR label in 1997 with the introduction of LED lighting in September 2008. ENERGY STAR certified lighting offers energy-saving options for both in and outside the home, such as recessed lighting and outdoor porch lights. An ENERGY STAR fixture is built to last for many years. Ask your local retailer for ENERGY STAR certified lighting. Consult this purchasing guide (PDF, 652 KB) for an easy way to find your perfect fixture. What do I need to know before I buy a light fixture? Look for the ENERGY STAR label for good quality, a minimum two-year warranty and long life (light sources last 15 times longer). Make sure you have a compatible dimmer switch if you want to dim your lights. Fixture manufacturers can provide a list of approved dimmers switches. Make sure you like the color of the light; there are lots of options, check out the Color and Mood page. EPA is kicking off a year-long effort to educate people about the benefits of energy-efficient, ENERGY STAR certified LED lighting, and we want you to “Light the Moment” with us! Join us in switching out 300 million inefficient bulbs to ENERGY STAR certified LED bulbs. Together, we could save about $1.5 billion dollars in annual energy bills and prevent 17 billion pounds of annual greenhouse gas emissions. Quality: Whatever the moment, there’s an ENERGY STAR certified LED light perfect for maximizing the impact. Light Distribution: ENERGY STAR LED bulbs light the small, intimate moments AND the big, busy ones. Long-life: Lasting over 13 years, an ENERGY STAR certified LED bulb will be there for all the moments it witnesses. Environmental Protection: Protecting the planet for future generations so we can continue to experience special moments for years to come. 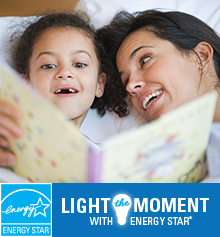 So, light the moment with ENERGY STAR and experience life to its fullest. By replacing the five most frequently used light fixtures in your home with ENERGY STAR certified models, you can save $45 each year in energy costs.